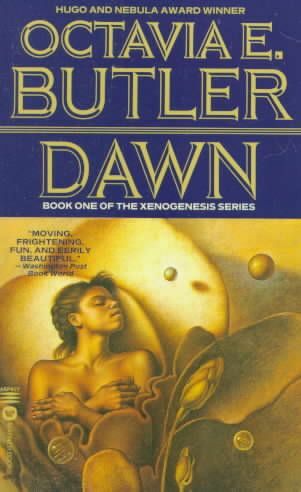 I’ve been charged with the completely overwhelming task of blogging about Octavia Butler’s Dawn. When I first received the course syllabus, I immediately began trying to find used bookstores that carried her work, though often times I had to call and speak to someone to find out. Without a doubt, everyone I spoke to was white, and between three different bookstores and six different people, each of them knew that Octavia was black and wrote science fiction, which made me proud and evoked the same feeling I get when a person who isn’t of color knows what Spelman is and why it is an important institution. Those in the majority often have the privilege of staying within their own world and of being ignorant of what goes on outside of it, while people of color are expected to and have learned to navigate between many different worlds, just as Lilith Iyapo does in Dawn. Often times while reading the novel, I’d forget that Lilith is a black woman and I asked myself if it mattered. And the answer is of course it does—Octavia wouldn’t have written it this way if it didn’t. Every single detail is accounted for, and that’s what makes this work special. It is Lilith’s ability to tackle so many unfathomable tasks, to cope with her captors, to relinquish her control to them, and to trust them that make her a black woman leader, and a leader in a situation where many would have given up. Lilith’s strength mirrors that of black women as a collective, both historically and presently, while Dawn itself echoes a slavery narrative—tragic and captivating. Butler seamlessly weaves together the remnants of our very real past and the scary uncertainties of our future. The Oankali, who appear to be the future, cite humanity’s hierarchical tendencies and vast intelligence as the downfall of the human race, and yet, they themselves appear to have a similar hierarchical structure and inclination towards superiority. The Oankali soon prove that they are what Europeans were to the Native Americans, and no different than the slave-holding Christians who beat the backs of my ancestors because they knew better, because they knew “the way.” Only in Dawn, the Oankali don’t use whips to prove their point; they instead rely on a psychological degradation that is arguably worse than physical punishment. The Oankali deny Lilith human contact, instruments to record her history and the answers to her questions. This seems to me no different than what happened to an entire diaspora of people. Butler uses the Oankali to tell the reader that history repeats. In Dawn Lilith teaches that the black woman continues to be a place of solace and strength even when history repeats itself. Five hundred years from now, she will be a leader—not because she never cracks, but because of her ability to put herself back together. Courtnee, first let me thank you for being the first brave soul to accept the task of blogging about Octavia E. Butler! Inasmuch as I like your title and the point that you are making about the strength of Black women, I find it difficult to accept the (all too commonly accepted) idea that Black women’s most important attribute is their strength. As a Black woman, I secretly (not so much a secret anymore) cringe at the thought of me always having to be the glue that binds, the foundation that holds, or the rock that anchors. While strength is by no means a negative attribute to have, it is a heavy burden to carry. I like to think that Black women matter for a plethora of reasons beyond just being strong: such as, being deliberate and contemplative. I n Dawn, Lilith exhibits both of these attributes. I think that as a character Lilith is like many of her fellow Earthling Black women–dynamic. And it would be doing her and injustice to say that it is just her strength that makes her ‘matter’, because it is also her contemplativeness and deliberateness that make her an exemplary leader. In the 1980’s, when Butler wrote Dawn, there were so few world leaders (especially the one[s] here at “home”) who exhibited an ounce of thoughtfulness in their actions/reactions towards “others”, that a heroine like Lilith was needed. In addition to Lilith being stylistically different, leadership-wise, from the leaders of the 1980’s, I think it was important for her to be the physical antithesis of said questionable leaders. Lilith’s Black woman-ness matters because although she represents the remnants of a dead and destructive Earthling society of the ‘past’, she also represents the much needed change for the future. Humankind needs more than strong people to survive and Lilith, like Black women, is more than just that. Thanks for your comment. In no way do I believe that a black woman’s worth (or Lilith’s) is based solely on her strength–in fact, this piece focuses on Lilith’s leadership abilities and the repetition of history. Having read Melissa Harris-Perry’s “Sister Citizen” and other scholarship on what it’s like to be a black woman today, and the many pressures (and blessings) that come with that, coupled with my own experience as a black woman, I would never disrespect an entire group of people in that way. Having to pick one point of many to write about was not easy, but I stand firm in my belief that this is more than just a trite, and obvious argument that, frankly, I’m tired of hearing. Of course we’re more than just one quality. You’re more than just a student, more than just a woman, more that just an English major. I’m willing to bet that sometimes it’s hard to separate them. It is true that black women have been the foundation and the rocks of their communities, just as it is true that they are human, which is why I write, “five hundred years from now, she will be a leader—not because she never cracks, but because of her ability to put herself back together.” Black women CAN and DO crack–I never look overlook this fact; that’s part of our humanity and part of what makes us beautiful. We recognize that many expect us to be strong, but we don’t have to accept that role. We have the authority to be whomever we want. Yes, it is overwhelming to have to be thought of as a source of strength, but where you cringe, Lilith didn’t, and that’s what makes her a black woman leader. Courtnee, I love your post! One thing I would add is that one of the things I found captivating about Lillith is her reluctance to be the cohesive force you describe her to be. The apprehensive leader, she does her job well, but she also fights and struggles beneath the burden of it. I think that really speaks to callmecarter’s point, that people expect strength from black women and that we are forced into these roles without much thought for our mental, physical, or spiritual well-being. While I do find Lillith an amazingly strong character, what I really love about Dawn is that it accurately paints a picture of what it means to be FORCED to be strong. It captures the dilemma of being an African American woman, of living in a culture where you are expected to carry the world on your back, in part because you keep accomplishing the task. Dawn doesn’t shy away from Lillith’s “cracks”. It shows the strain the unwanted leadership places on her and it shows how she deals with it, whether it be well or horribly. It explores the complicated relationship she has with her captors and as result of that relationship, the complicated relationship she has with her fellow humans. So often black women are ridiculed for being complicit with our oppression (Why are we nannies?! Why are straightening our hair?! We’re emasculating our men!) and we are not even appreciated for all we do in spite of our oppression. Butler’s adeptness at capturing all these themes within this novel is what made it real to me. Like you said, black women are so strong. But more than that, the reasons and uses of our strength are so complex so to have that dynamic captured even a little bit is truly awe-inspiring. I would like to thank and congratulate you on being the brave soul to post the first blog. I believe that the book is written to make us forget he race for a certain amount of time. We as readers are reminded very little of her race. This is because as a reader I believe Butler is trying to show us that the Oankoli are trying to make the humans into one race, and one being that they deem fit. I feel that the reason Butler describes race so little because it adds to the fact that humans are changing and saying that the future which may be negative in some ways is going to be positive because problems like race will be gone. Just as they are taking away history they are taking away any reason for humans to want to dislike or fight one another. I also agree though that the book is based on a slavery that is separation of humans from one another which is the worst way. Humans are social beings and taking that away can crush the soul. I would definitely agree with your statement that this novel is evidence of the importance of black women, but I would argue that it’s less about the characteristics of Lilith and more about the rarity of her presence and even more so as a leader. Lilith’s success as a character and Dawn’s success as a novel goes against the status quo of white male leaders in speculative and science fiction, which I feel is her most important role. Black bodies don’t seem to fit into popular speculative fiction, and Lilith’s richness as a character highlights how much they are actually missing. In too many novels, where “race” doesn’t exist anymore and the world just becomes a big human and nonhuman binary, the human is actually a white male. But Dawn proves the black woman as inseparable from humanity– in fact, she’s the one saving it! I also have to agree that there is a repetition of history in Dawn. I appreciated Butler’s characterization of Lilith because she challenges the negative depictions of Black females being loud, angry, and all the other elements of the stereotypes. Not only did Lilith demonstrate leadership through her strength but also by being smart, showing compassionate, and the ability to be flexible and compromise. Although she had doubts about the Oankali and did not trust them, to an extent, she still is able to connect with them, particularly Nikanj, who she cares for and uses her body to save his life. She plays it smart by giving them what they want of her so that she can have what she wants: to be back on Earth. This reminded me of how slaves would outsmart their masters by going with the flow but secretly doing things on their own terms. She does what she has to in order to survive. I found myself wondering if she would have “saved” the other humans if it was not required of her to do so. I do believe she would have though.